If you haven’t noticed, I like my crafts cheap and quick. In the past Halloween hasn’t been that big of a deal–I skip it and go straight to my fall or Thanksgiving decorations. 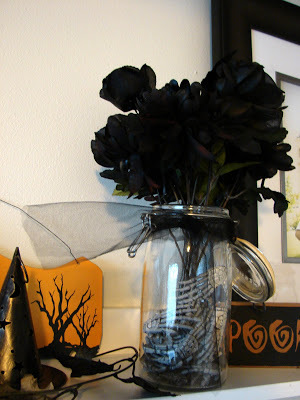 But this year, I decided to change things; I wanted to dress things up with Halloween Decor. It is still a work in progress, but luckily Halloween isn’t tomorrow so I still have time. 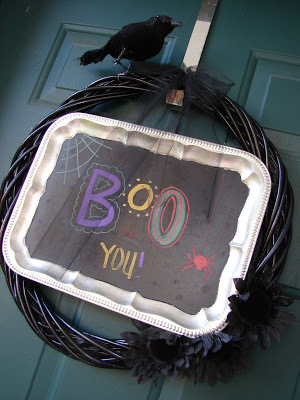 I’m posting these ideas now–and hope to post more in the next little bit–in case you are suffering from Halloween blahs and need a little decor refresh in your house. The black and white pennant flags, I love them. Raided my stash of black and white fabric and created this. How many holidays will black and white work for? I may leave it up all year. My mom made this silver tray chalkboard for me. She found a silver tray at the thrift store, and painted it with chalkboard paint. She intended it to sit on a small easel on the counter–but I stuck it on the front door! The wreath, flowers and crow all came from Dollar Tree. 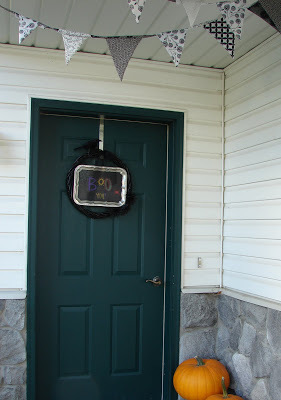 I painted the wreath and flowers black. The tray is tied on with tulle so I can take it off to change the sayings as I feel like it. 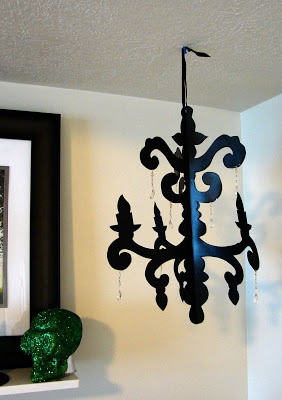 I found this paper chandelier template on the Yoko Chapman site intended for a wedding. I blew it up to 16×20 and traced it onto poster board, cut out with an exact-o knife, and double side-taped it together (the Yoko Chapman site is no longer). I then took my can of black spray paint to it. The crystals are fringe from Hobby Lobby I cut apart and taped between the layers. It fills in the corner nicely, and has already gotten a lot of compliments. I’m a silk flower snob. I like the look of real flowers (and I know the difference, my degree is in plant science after all) and silk flowers that look good cost a lot of money. But if you are painting them black then it doesn’t matter! These flowers came from, yep, Dollar Tree. The picture isn’t very good, but I have mums, roses, and sunflowers all painted black and arrange in a jar of skeleton hands (also from Dollar Tree). There’s no photo of this, but my 3 year old and I took our Chalk Ink Markers (they are fabulous-you should buy a set) and altered our photos hanging in the dining room. Pirate patches, horns and tails, mustaches, freckles, Frankenstein bolts, and nasty teeth keep him and our guests laughing. You just draw right on the glass, and the marker wipes off with a wet cloth. When they dry they look like chalk (I used them on the sign). Seriously, they are cool. Michaels is the only place I have been able to find them. 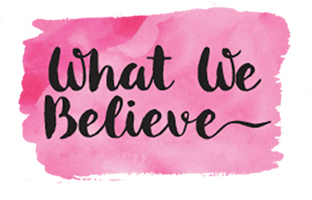 Love all of these ideas Nikkala LOU! Looks great. LOVE the silver tray idea! Wow.. those all came out great! And I love that how inexpensive they are. I am loving that chandelier! Brilliant! Thanks for the info on the chalk markers! Didn’t even know they existed! Next time you do something easy and cheap like this, please call! I will be an avid student! Oh my, I love the chalk pen idea. Thanks for sharing. i have those same skeleton hands and was planning on doing something similiar. thanks for some inspiration! Hi, I was wondering if you still had the template saved on your computer or handy to scan in (I know that second part is asking A LOT). I have tried going to yoko chapman’s site, but it is no longer up it appears? I can’t find the template any place else and would LOVE this in my daughter’s room! I LOVE the chandelier and would appreciate a link or copy of the template. I would also love the chandelier template. Also, Staples and Office Max also carry those chalk markers. The last time I checked they are a good deal cheaper there too. I’ll have to check out the chalk markers at Staples! Thanks for the tip. Please send us an email for the chandelier template. May I please get your template for the chandelier? I love it and have tried my hand to self-draw a template, but it doesn’t look good.